Classic-Castle.com • View topic - Job Mullers Contest - The winners! Job Mullers Contest - The winners! Alright, here we are, after 3 long, hard days of judging 24 hours a day, neither of us got any sleep, both of us called in sick to work these past 3 days, and between the two of us we consumed a grand total of 260 cups of coffee, but the results are in! We judged these entries based on a few factors, I'll start by explaining a little bit about how we judged. - The originality of the idea. The funnier the better, of course. Unique and hilarious ideas were what we were looking for, and unique and hilarious ideas were what we got! - The execution of the idea: How do you show your job being performed, how do the worker's looks and actions connect to the job? - The build itself: Is it well built, or sloppily slapped together in 2 minutes? - The presentation: Do your pictures clearly show what you want us to see, or do we have to look hard and long before we can figure out what goes on in there? These are basically the criteria we looked at, and upon which (after the necessary arguments because of course we don't agree on everything) we rated your entries, and as such came to the three that scored the highest. The combination of great fun and a solid build make this one a winner. 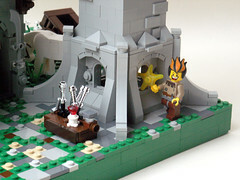 RichardAM wins a MISB 6048 Majisto's Magical Workshop! The posing and expressions in this scene are just beyond hilarious, and the MOC is particularly well built. Great job! It made us both laugh out loud. Crises wins a MISB 1736 Wizard's Cart! 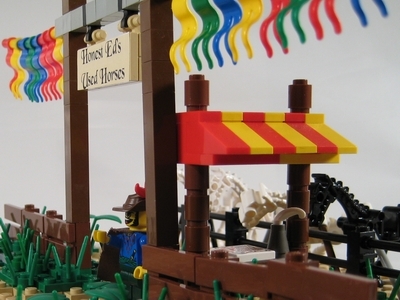 Stuifzand brings us another outstandingly built MOC. I have to point out the woodwork on the house for anyone who hasn't taken a closer look at it yet. The weather controller has that flaky mad scientist look while still keeping it medieval, which just looks downright funny in the best way possible. Stuifzand wins a MISB 5614 The Good Wizard! Super special secret unannounced prize! We have a 4th little unannounced prize, selected by a super special secret judge to tell us which particular entry made him laugh the most. Which one made him fall off his chair? Which one made him run around the house collecting family members and pets alike to come look at it? Robin Hood wins an Evil Wizard! Could the above winners please PM me or Bluesecrets, so we can get your prizes shipped out to you? As I said at the end of the contest, I am very pleasantly surprised by the amount and quality of entries and it makes me happy enough to want to write a little review about every single entry! I'll be devoting a bit of my time every day to post a few reviews about your entries, and I'll be sure to mention every single one of them and how they did in my opinion. So if you're wondering how your entry did and why, keep an eye out for my entry reviews topic! Thanks again to everyone who entered for making this contest one of the funniest out there! I also would congratulate not only our winners but everyone who participated in the contest. There were far more than I expected. They were funnier and more creative than I could have ever imagined. Great job for the contestants and great prizes that you fellas provided. Congratulations to all the winners and hope that your new prizes will help you make bigger and better mocs for all of our enjoyment! Dang! I thought I had a chance. Well, great job winners! Congrats to the winners! I enjoyed looking through all the entries, some very clever ideas! Congratulations to the winners! I had a great time building my entry and looking at everyone's submissions over the past couple weeks. Thanks you Aliencat and Bluesecrets for having the contest and providing the prizes! What a great idea. Congratulations to all winners! My personal favorite? Sir Nadroj's Ye Olde Electrician. Very funny and very well executed. But what a great contest, there were so many really good entries... I knew I had no chance but it was fun entering anyway. Congratulations to all participants, your ideas are more than great. I laughed many times. Thanks to Aliencat and Bluesecrets for this contest. Congrats Winners, Thank you BlueSecrets and AlienCat for hosting this, and thank you everybody who entered and made me laugh. Thanx a lot for organising this. It got me moccin' after years of darkageish nothingness. It was huge fun, and many of the moc's made me smile, chuckle or laugh. Thanks for the fun contest guys! I really enjoyed making my entry and seeing all of the others. Congratulations much to those who won. Funny, I didn't respond to any of these in their topics.... I don't know why. Phenomenal entries. 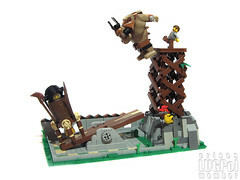 Congratulations to the winners, your MOCs were very funny and highlighted a unique aspect of the LEGO Castle world.